Financial planning is a big concept that includes things like budgeting, retirement planning, saving, insurance and getting out of debt. You don't, however, need to be a financial planning expert to have a firm grasp on what each of these concepts means and how they impact you. Use this guide to gain a deeper understanding of how they work together to lay the groundwork of a solid financial foundation for you and your family. At the very basic level of personal finance, you should understand the need for, and value of, a budget. A budget or spending plan is a road map for telling your money what to do each month. At its simplest, a budget lists how much income you have coming in, compared to what's going out each month. Creating a detailed and​ ​written budget allows you to make smarter decisions with your finances on a daily basis. When you're faced with spending money on something, a budget requires you to stop and think about the purchase. You realize that by spending money in one area, you won't have to spend--or save--elsewhere. When you create a budget, you begin to see a clear picture of how much money you have, what you spend it on, and how much, if any is left over. Ideally, you'll have a surplus left over which you can use to save for retirement, build up your emergency fund, pay down debt or apply to other financial goals. The simplest way to create a budget is on paper, but you can also use a budgeting spreadsheet, software or budgeting app to get the job done. If it's your first time budgeting, consider testing out different approaches each month to find the one that best fits your needs and style. After you've successfully created a basic budget, you'll have a much better understanding of where your money goes and where you can possibly trim expenses. For many people, this is as simple as cutting back on some of the little things that can add up. For others, it may mean taking a closer look at spending to make deeper cuts in order to create a wider gap between monthly inflows and outflows. For example, some of the smaller variable expenses you may consider eliminating include unnecessary subscription services or recurring memberships you don't use. Bigger cuts could result from refinancing your mortgage or wiping out an entire spending category, such as dining out. Why is reducing expenses important? Three reasons. First, it can free up more money in your budget so you're less inclined to rely on credit cards or loans to cover spending gaps. Second, if you have debt, adding extra money back into your budget can help you pay it off faster. And third, having extra money can help you boost your emergency fund or grow retirement savings. Even after creating a sound budget and cutting unnecessary expenses, you may still find yourself with lingering debt to get rid of. Using credit and taking on some debt itself isn’t necessarily a bad thing, but when you can't keep up with the payments or borrow more than you can afford to pay back, you could be in trouble. Getting out debt becomes even more difficult when you're facing a high interest rate on credit cards or loans.One of the most important steps in getting out of debt is to pay more than the minimum amount due each month. Even a modest credit card balance can take over a decade to pay off if you simply pay the minimum amount due because of interest and finance charges. That could end up costing you thousands of dollars that could be better used towards savings. Giving the snowball method a try, or looking into a credit card balance transfer, could help you get out of debt sooner. With fewer companies offering full pension plans and the uncertainty of Social Security, it's become more important than ever to save and plan for your own retirement. Unfortunately, many people feel that they simply don’t have ​enough money left over each month to save. That, however, can be costly if you delay saving until later in life because it means missing out on the power of compound interest. Retirement savings needs to become a priority instead of an afterthought. 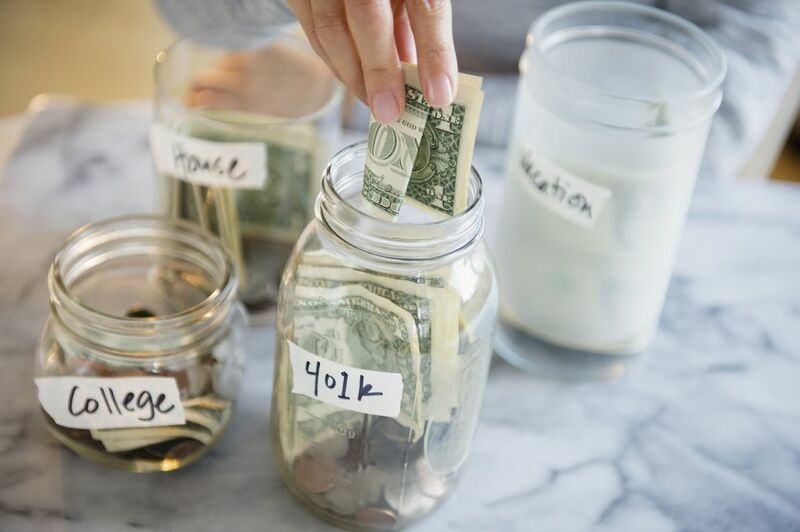 The Internal Revenue Service has made saving for retirement even more attractive with special tax-advantaged accounts such as employer 401(k) plans, individual retirement accounts and special retirement accounts for the self-employed. These accounts allow for tax deductions, credits and even tax-free earnings on some retirement savings. If you're not saving for retirement yet, revisit your budget to see if you have room to include it. You've created a budget, cut expenses, eliminated your credit card debt and have started saving for retirement, so you're all set, right? While you've definitely come a long way, there is one more important aspect of your finances that you need to consider: insurance. You've worked hard to build a solid financial footing for you and your family, so it needs to be protected. Accidents and disasters can and do happen and if you aren’t adequately insured it could leave you in financial ruin. You need insurance to protect your life, your ability to earn income, and to keep a roof over your head. Life insurance, disability insurance and homeowners' insurance can help with those scenarios. One question you may have is, what kind of life insurance do I need? Term life offers you for a set period of time; permanent insurance covers you for life, with some policies offering the benefit of cash value accumulation. Permanent life insurance, however, can be more expensive than term life. When choosing between the two, it's important to consider which one is the best fit for your needs and goals.